Most pet owners consider neutering their cats because it makes their pets healthier and more behaved creatures. While the procedure is both economical and beneficial to the pet, it’s highly important that you know how to effectively take care of your furry friend after undergoing the surgery. It’s prudent to know the dos and don’ts in properly caring for your newly neutered cat. Here are some of the things you should remember. After bringing your cat home, he’ll most likely be feeling some anesthetic effects. Typically, vets apply some form of protective ointment on his eyes to ensure they don’t dry out. The ointment can cause the cat to have blurry vision. Consequently, you need to place him in a dark, warm, and quiet indoor location to recover for twenty-four hours after the surgery. During this time, it’s important to keep other pets – even kids – away from the cat. Even the most affectionate and sweetest cat can become aggressive, biting or scratching anything when he feels frightened. The hangovers of anesthesia usually disappear within 24 hours. After this period, the personality of your cat usually goes back to normal. 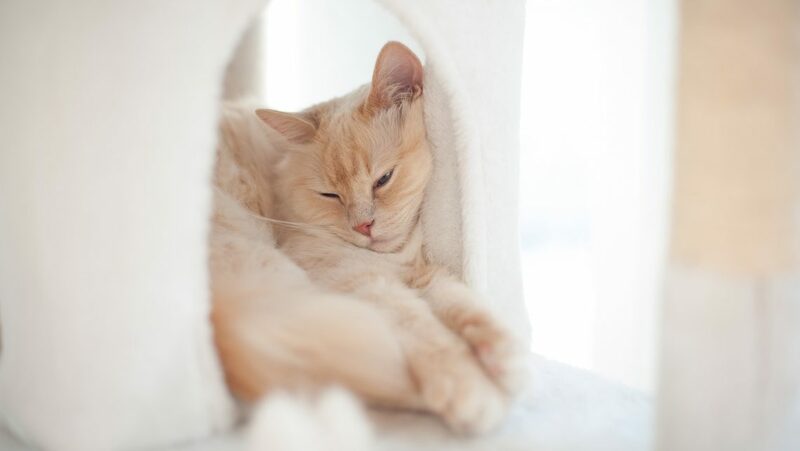 Vets recommend that you stay with your cat on the first night in order to observe his activity levels and carefully monitor your cat’s recovery. What About Water And Food? Once your cat gets home from the vet, you should give him water. The amount should be minimal to avoid vomiting. Only keep a small amount of water in a bowl and then top it off when necessary. When your cat is awake and alert, you should offer one-fourth to a half portion of his normal food intake. If he vomits, you need to take away the remainder of the food. Avoid offering food again until the following morning. The day after surgery, give your cat regular amounts of water and food. Since the anesthetics can make your cat a bit nauseous, it’s normal if he does not eat right away. But if your feline friend isn’t drinking or eating normally 48 hours after surgery, you need to consult your vet immediately. Twenty-four to 36 hours after surgery, it’s normal for your cat to experience some minor discomfort and soreness. As such, vets give pets a long-acting pain medicine in a form of an injection after surgery. Experts prohibit the use of most pain relievers, including those that contain acetaminophen, aspirin, or ibuprofen since they’re known to cause serious complications and in severe cases, death. If you think that your cat needs pain-relieving medication, you need to contact your vet first. It’s highly important that you follow the instructions of your vet regarding the medicines he or she will prescribe. As much as your cat chooses not to eat, he still needs to relieve himself. With that said, you should place a sparkling clean litter box close to your cat’s resting spot for his convenience. It’s not ideal to let your pet cat walk after the surgery. 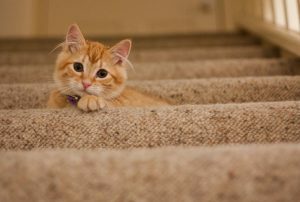 Dirt or dust from kitty litter find their way into the incisions and may result in an infection. For this reason, you need to utilize a shredded paper litter for roughly seven days after the operation. The other thing you need to do is monitor his urine for blood. A tiny amount of blood may be evident within the first 24 hours post-surgery. But if you notice there is still blood the next day, it’s high time to call a vet. The anesthetics given during surgery can cause diarrhea or constipation, which may last 24 to 48 hours after the operation. 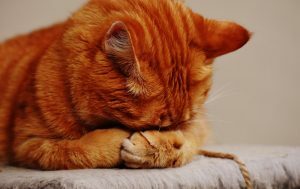 If you notice that your cat is unable to defecate or urinate normally within the first 72 hours post-surgery, you need to contact your vet immediately. Within one or two days after the surgery, your cat may return to his normal self. However, you need to keep him indoors for seven days to make sure it has fully recovered. Letting the cat stay inside the house also gives you the opportunity to monitor your pet closely in terms of activity levels and healing process. You shouldn’t allow him to climb stairs, run, jump, or even play during the first-week post-operation. Letting the newly neutered/spayed cats move too much can slow down the cut’s healing process. To be on the safe side, it’s important to keep your cat inside a small room, in a crate or inside a carrier. Don’t rush his recovery. It is much better to let your cat rest throughout the week. If my kitten has ringworm, can she and/or may she get neutered? Hi Livia. Talk to your veterinarian about that. Ringworm is a fungal disease that may take some time to eliminate. Depending on the type of treatment you’re doing to treat the ringworm, she may or may not be subject to surgery. During the surgery she will be given anesthetic, antibiotic and anti-inflammatory drugs and that may be a lot to handle and metabolise if she’s doing and anti-fungal treatment on top of that. There may even be unwanted drug interactions due to it. Talk to your vet but our guess is he’ll want you to wait until you get the ringworm problem definitively solved before getting her neutered. Hey what if your cat is vomiting? Is it something to be worried bout? Hi Lexi. We would recommend staying off the catnip on the first day post-surgery. Just let the anesthetic wear off and let her get back to her usual self. Normally she will just need time before regaining her normal appetite and bathroom habits. Cat was neutered today. Acting very hyperactive now not calm at all. Cone irritating him and he is fighting it. Any suggestions? Hi Fran. You can take the cone off as long as you are supervising him and keep him away from the surgical location. That normally helps to calm them down. I recently had three feral cats spayed/neutered and we are keeping them in small kennels with bed/food/water/paper litter. All seem to be doing well except one male who refuses to eat. It has been 48 hours. The little guy has put himself to the back of the kennel. He seems alert and scared. Is it time to take him to the vet or is this normal with a feral? It could just be behavioural and have nothing to do with the surgery. Were they confined before the surgery or did their environment change after? If that’s the case, then it could just be stress from the confinement and normally with some patience and a lot of calm (maybe some feromone sprays to calm them down) he’ll come around. My cat just got home from the vet and he is restless. We have him in a dark room but he won’t stay still. What do you recommend doing? Hi Aidan. A dark room is ok but your cat might either be on the effect of the anesthetic, still. Or he is stressing out because his routine changed and cats don’t like changes in their lives, for the most part. The best advice we can offer at this time is to use some calming feline feromones if you can find them at your local veterinarian or pet shop (it’s a spray or electrical diffuser to send chemical signals into the air that tell your cat “it’s ok”). Other than that you can go into the room with him and wait it out. Just talk in a calm, soothing voice and don’t make any attempts to catch or stop him, just let him come to you in his own time. Every cat is different. Is there still viable sperm in a cat that’s just been castrated and could he still bred for for a time? Yes! For up to 2 months it is still possible for the cat to have sperm and he could still breed. Its been 5 days since my 14 week old boy has been neutered. He rarely goes in his paper shred filled litter box, its most of the time on his blanket,but got out yesterday and went in my other cats box with litter (i use Worlds Best which is corn kernals) is that ok? And can i add a small scoop of it to the shredded paper? Hi James. After 5 days the risk of infection is low and if he ends up using the other litter anyway, you might as well add some to a corner of his own litter with the shredded paper so he can feel more inclined to use it. Restlessness and hunger are normal signs. You shouldn’t let her eat ALL she wants because it’s not really hunger. Just keep to her regular quantities. It’s also normal for other cats to get annoyed at other pets once they come from surgery. Their smell changes at the vet due to medication and other cats may not recognize them. After a few days everything tends to go back to normal.